Premium-quality micrograin solid carbide bit is precision ground for an extra-fine finish with maximum sharpness and edge retention. 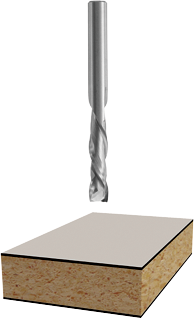 Compression spiral bits are ideal for CNC applications requiring high feed rates and a clean finish. They are suitable for double-sided melamine or laminated material, as they produce a clean finish on top and bottom of the work piece. Double flute allows for the best finish.